Sertraline is primarily used to treat major depression in adult outpatients as well as obsessive-compulsive, panic and social anxiety disorders in both adults and children. A survey of the literature reveals that most of the reported methods are either insufficiently sensitive or tedious and require highly sophisticated and dedicated instrumentation. The proposed method is considered to be specific for determination of SER in presence of its metabolite (deaminated form). A sensitive, simple and specific spectrofluorimetric method was developed for the determination of sertraline (SER) in pharmaceutical formulations and biological fluids. The method is based on its reaction with 9-fluorenylmethyl chloroformate (FMOC-Cl) in borate buffer of pH 8.0 to yield a highly fluorescent derivative peaking at 315 nm after excitation at 265 nm. The different experimental parameters affecting the development and stability of the reaction product were carefully studied and optimized. The fluorescence concentration plot was rectilinear over the range of 0.05-1.0 μg mL-1 with a lower detection limit of 5.34 × 10-3 μg mL-1 and limit of quantitation of 0.016 μg mL-1. The proposed method was successfully applied to the analysis of commercial tablets and the results obtained were in good agreement with those obtained using the reference method. Furthermore, the method was applied for the determination of SER in spiked and real human plasma. The mean % recovery (n = 3) was 94.33 ± 1.53 and 92.00 ± 2.65, respectively. A proposal of the reaction pathway was postulated. 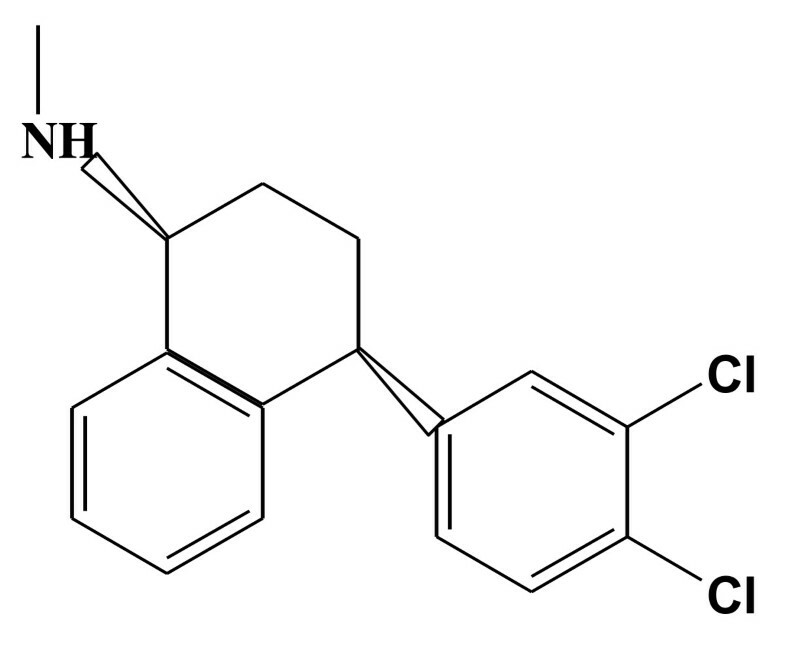 Sertraline (SER); (1S)-cis-4-(3,4-dichlorophenyl)-1,2,3,4-tetrahydro-N-methyl-1-naphthalenamine (Figure 1) is primarily used to treat major depression in adult outpatients as well as obsessive-compulsive, panic and social anxiety disorders in both adults and children. The efficacy of sertraline for depression is similar to that of older tricyclic antidepressants, but its side effects are much less pronounced . Several methods have been reported for the determination of SER either per se or in pharmaceutical preparations and biological fluids. These methods include: spectrophotometry [2–4], voltammetry , HPLC [6–11] gas chromatography [12, 13]. A literature review up to 2008 has been described by Espinosa et al . The review described the different analytical methodologies for the determination of SER chromatography and liquid mass spectrometry [15, 16]. Most of these methods are either insufficiently sensitive [2–4] or tedious and require highly sophisticated and dedicated instrumentation [6–16]. This led us to study the reaction of sertraline with 9-fluorenylmethyl chloroformate (FMOC-Cl) in an attempt to develop a simple and sensitive spectrofluorimetric method for its determination in pharmaceutical preparations and biological fluids. 9-Fluorenylmethyl chloroformate is a useful derivatizing agent used for the determination of amino acids, primary amines and secondary amines. Several pharmaceutical compounds have been determined through this approach [16–21]. To the best of our knowledge, up till now nothing has been reported concerning the spectrofluorimetric determination of sertraline. This encouraged us to develop a simple and sensitive method for its determination in tablets and human plasma. The results obtained were promising. The fluorescence spectra and measurements were recorded using a Perkin-Elmer UK model LS 45 luminescence spectrometer, equipped with a 150 Watt Xenon arc lamp, grating excitation and emission monochromators for all measurements and a Perkin-Elmer recorder. Slit widths for both monochromators were set at 10 nm. A 1 cm quartz cell was used. Derivative spectra were evaluated using Fluorescence Data Manager (FLDM) software. Sofware used is FL WINLAB, Version 4.00.02, copyright 2001, Perkin Elmer, Inc., UK. (a) Setraline pure sample was kindly provided by Pfizer (Sandwich, UK). (b) Tablets containing sertraline HCl equivalent to 50 mg of sertraline base each (Lustral® tablets), batch # 7201 were obtained from commercial sources in the local market. (c) 9-fluorenylmethyl chloroformate (FMOC-Cl), was purchased from Sigma (St. Louis USA). A stock solution containing 20 mg % of FMOC-Cl was freshly prepared in acetonitril and was further diluted with the same solvent to obtain 0.01 mg % solution. (d) Borate buffer 0.2 M solutions of pH 8.0. and pH 12. (e) Acetonitrile, acetone and diethylether (Merck, Darmstadt, Germany). (f) Human plasma samples were kindly provided by Mansoura University Hospital, Mansoura, Egypt and was kept frozen at -2°C until assay after gentle thawing. A stock solution was prepared by dissolving 20.0 mg of SER in 100 mL of acetonitrile in a volumetric flask. This solution was further diluted with the same solvent as appropriate. The standard solutions were stable for seven days when kept in the refrigerator. Aliquots of SER standard solutions were transferred into a series of 10 mL volumetric flasks. Borate buffer, pH 8.0 (2.5 mL) was added, followed by FMOC-Cl (0.01 mg %) (2 mL) and mixed well. Acetonitril (3 mL) were added. The reaction mixture was left at room temperature for 15 min., and then completed to the mark with distilled water. The fluorescence intensity of the reaction product was measured at 315 nm after excitation at 265 nm. A blank experiment was carried out simultaneously. The corrected fluorescence intensity was plotted vs the final drug concentration (μg mL-1) to get the calibration graph. Alternatively, the corresponding regression equation was derived. Twenty tablets were weighed and pulverized well. A weighed quantity of the "powder, equivalent" to 20.0 mg of SER was transferred into a small conical flask, and extracted with 3 × 30 mL of actonitril. The extract was filtered into 100 mL volumetric flask. The conical flask was washed with few milliliters of acetonitril. The washings were passed into the same volumetric flask and made up the mark with the same solvent. Aliquots covering the working concentration range was transferred into 10 mL volumetric flasks. The procedure described under " General recommended procedures" "was then applied. The nominal content of the tablets was determined either from the calibration curve or by using the corresponding regression equation. A stock solution containing 20.0 μg mL-1 of SER was prepared in acetonitrile. Control samples of plasma were spiked with different quantities of SER. Acetone (2 mL) was added, then the mixture was vortexed and centrifuged at 3500 xg for 10 min. 3 mL of the clear supernatant was separated, and borate buffer, pH 12 (1 mL)was added. The solution was extracted with 3 × 5 mL of diethylether for 2 min, then centrifuged at 3500 xg for 5 min. The resulting supernatant was evaporated to dryness under nitrogen at ambient temperature. The residue was dissolved in 2 mL of acetonitrile. The general recommended procedures applied for pure sample were then performed. The nominal content of the drug was determined using the corresponding regression equation. FMOC-Cl was chosen as a fluoregnic derivatizing agent for SER because of its superior properties, as compared to other reagents. It reacts under mild conditions with primary and secondary amines in alkaline medium and the resulting derivatives are stable. It has been utilized for the determination of amino acids and primary amines . Recently FMOC-Cl was further used for the analysis of some pharmaceutical compounds containing primary or secondary amino groups viz; trimetazine  roxithromycin  clarithromycin  alendronate  and topiramate . In the present study, SER was found to react with FMOC-Cl at pH 8.0 forming a highly fluorescent derivative with λ maximum of 315 nm after excitation at 265 nm (Figure 2). Fluorescence spectra of excitation and emission. 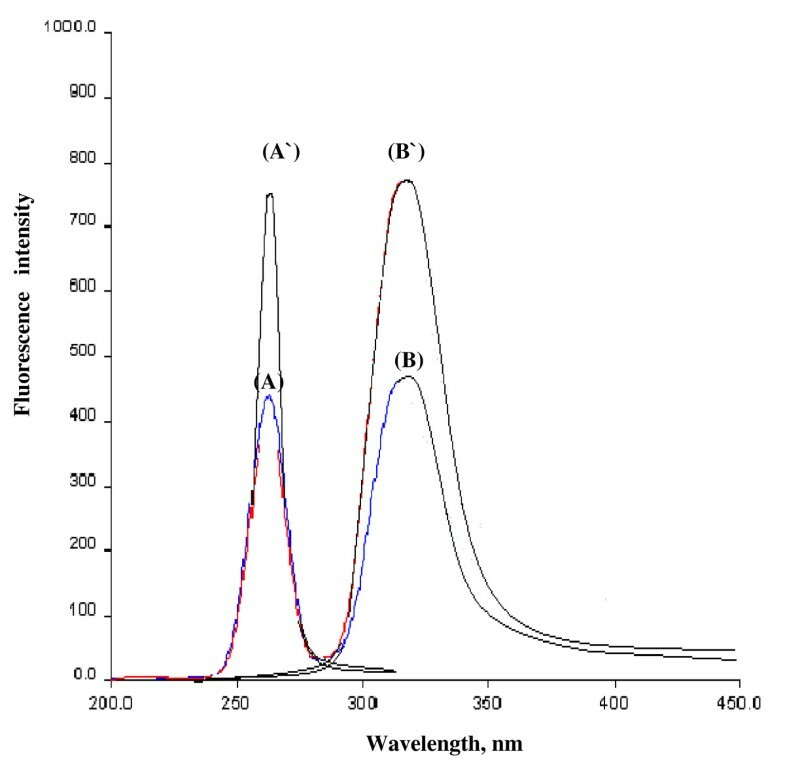 (A) Excitation spectra of blank (B) Emission spectra of blank (A') Excitation spectra of SER (1 μg mL-1) with FMOC-Cl at pH 8.0 (B') Emission spectra of SER (1 μg mL-1) with FMOC-Cl at pH 8.0. The spectrofluorimetric properties of the reaction product as well as the different experimental parameters affecting its development and its stability were carefully studied and optimized. Such factors were changed individually while the others were kept constant. The factors included pH, type of buffer, volume of buffer, concentration of the reagent, reaction time and volume of acetonitrile. The influence of pH on the fluorescence intensity of the reaction product was evaluated. 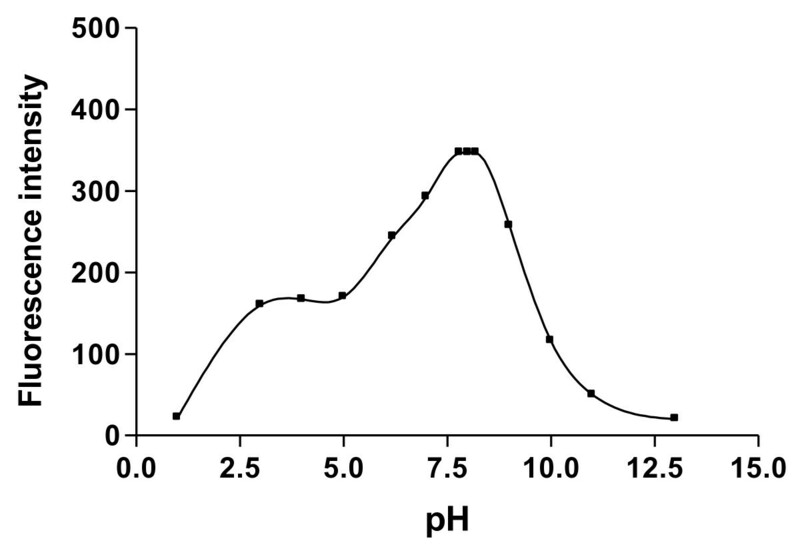 Maximum fluorescence intensity was obtained at pH 7.8 and remained constant up to 8.2 after which the fluorescence intensity of the reaction product began to decrease gradually until pH 13. Therefore, pH of 8.0 was chosen as the optimum pH (Figure 3). Other buffers having the same pH value such as phosphate and hexamine were tried and compared with 0.2 M borate buffer. Borate buffer was found to be superior to phosphate and hexamine buffers having the same pH value since the net fluorescence intensity was highest in the case of borate buffer. Effect of pH on the fluorescence intensity of SER (1 μg mL -1 ) with FMOC-Cl. It was found that increasing the volume of 0.2 M borate buffer of pH 8.0 up to 2 mL resulted in a gradual increase in the fluorescence intensity of the reaction product and after which it remained constant till 3 mL, therefore 2.5 mL of the buffer was chosen as the optimal volume throughout the study. The influence of the concentration of FMOC-Cl was studied using different volumes of 0. 01 mg % of the reagent solution. It was found that the reaction of FMOC-Cl with SER started upon using 0.25 mL of the reagent in the presence of borate buffer (pH 8.0). Increasing the volume of the reagent produces a proportional increase in the fluorescence intensity of the reaction product up to 1.8 mL and remains constant up to 2.2 mL. 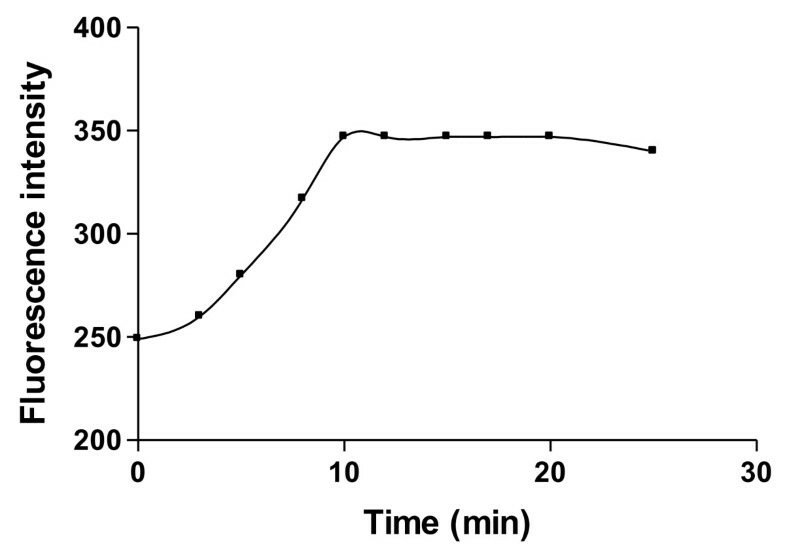 Therefore, 2 mL of 0.01 mg % of FMOC-Cl solution was chosen as the optimal volume of the reagent. Increasing the reaction temperature higher than the room temperature up to boiling for 20 minutes. resulted in a subsequent decrease in the fluorescence intensity of the reaction product. Different time intervals were tested to ascertain the time after which the solution attained its highest fluorescence intensity. 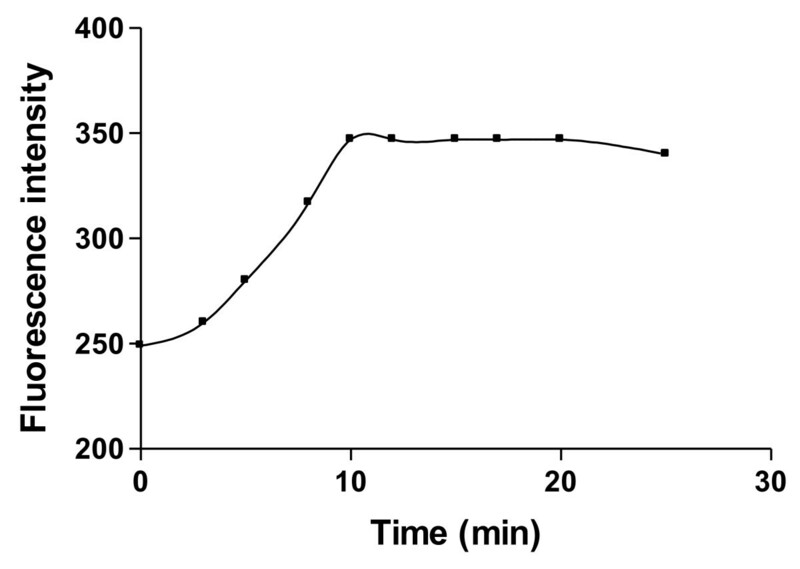 It was found that after 10 minutes the reaction product reached the highest fluorescence intensity and remained stable up to 20 min, after which very slight decrease in the fluorescence intensity of the reaction product was observed (Figure 4). Therefore, the reaction product was measured after 15 min at room temperature (25°C). Effect of reaction time of on the fluorescence intensity of the reaction product of SER (1 μg mL -1 ) with FMOC-Cl. The validity of the method was tested regarding; linearity, specificity, accuracy, repeatability and precision according to ICH Q2B recommendations . -Minimum detection limit, LOD (μg mL-1 ). -Limit of Quantification, LOQ(μg mL-1). -Sy/x = standard deviation of the residuals. where F is the fluorescence intensity, C is the concentration of the drug in μg/ml and r is the correlation coefficient. The limit of quantification (LOQ) was determined by establishing the lowest concentration that can be measured according to ICH Q2B . The results are shown in Table 1. The limit of detection (LOD) was determined by establishing the minimum level at which the analyte can be reliably detected, and the results are also abridged in Table 1. Where σ: is the standard deviation of the intercept of regression line. S: is the slope of the calibration curve. The proposed methods were evaluated for the accuracy as percent relative error (% Error) and the precision as percent relative standard deviation (% RSD) (Tables 1 and 2). Figures between parentheses are the tabulated t and F values respectively, at p = 0.05 . To test the validity of the proposed method, it was applied to the determination of an authentic sample of SER over the working concentration range. The results obtained were in good agreement with those obtained using a reference method.11). Using Student's t-test and variance ratio F-test  revealed no significant difference between the performance of the two methods regarding the accuracy and precision, respectively (Table 2). The validity of the methods was proved by statistical evaluation of the regression lines, using the standard deviation of the residuals (Sy/x), the standard deviation of the intercept (Sa) and standard deviation of the slope (Sb). The results are abridged in Table 1. The small values of the figures point out to the low scattering of the points around the calibration line and high precision. The repeatability was performed by applying the proposed methods for the determination of three concentrations of SER either in pure form or in tablets on three successive times, and the results are listed in Table 3. Each result is the average of four separate determinations. It was performed through repeated analysis of SER either in pure form or in tablets, using the concentrations showed in Table 3 for a period of 3 successive days. The results are summarized in Table 3. The proposed methods were then applied to the determination of SER in its tablets. The methods were tested for linearity, specificity, accuracy, repeatability and precision according to ICH Q2B recommendations. The results of the proposed methods were statistically compared with those obtained using the reference method . Statistical analysis  of the results, using Student's t-test and variance ratio F-test revealed no significant difference between the performance of the proposed and reference methods regarding the accuracy and precision, respectively (Table 4). -Mean found (%) ± SD. The tabulated values of t and F are (2.45) and (6.94) respectively, at p = 0.05 (24). The reference is based on an HPLC determination of sertraline HCl either inpure form or in its tablets using a mobile phase consists of methanol: phosphate buffer (20: 80 v/v) of pH 4.5 with UV detection at 270 nm. This investigation conforms to the Egyptian Community guidelines for the use of human in experiments. The human Ethics Committee of Faculty of Pharmacy, Mansoura University, approved the study. The high sensitivity of the proposed method allowed the determination of SER in spiked and real human plasma. Following oral administration of a single 50 mg sertraline dose after an over night fast, the mean plasma level of 0.05-0.2 μg/mL was achieved after 6.9 hour (25). This values lie within the working concentration range. Sertraline is extensively metabolized via N-desmethylation, oxidative deamination and subsequent reduction, hydroxylation and glucuronide conjugation. About 40-45% of an administered dose is excreted in urine as unchanged drug . The extraction procedure described by Kim et al  was adopted here. The results are satisfactorily accurate and precise. The within-day precision was evaluated through replicate analysis of blank human plasma samples spiked with different concentrations of the drug. The percentage recoveries based on the average of three separate determinations were 94.40 ± 1.14, thus indicating the high precision of the method (Table 5). The inter-day precision was also evaluated through replicate analysis of plasma samples spiked with 0.1 μg mL-1 of drug on four successive days. The percentage recoveries based on the average of four separate determinations were 92.80 ± 2.27. The results are shown in Table 5. On the other hand, for real human plasma, the percentage recoveries based on the average of three separate determinations were 92.23 ± 2.89. The stoichiometry of the reaction was studied adopting the limiting logarithmic method . 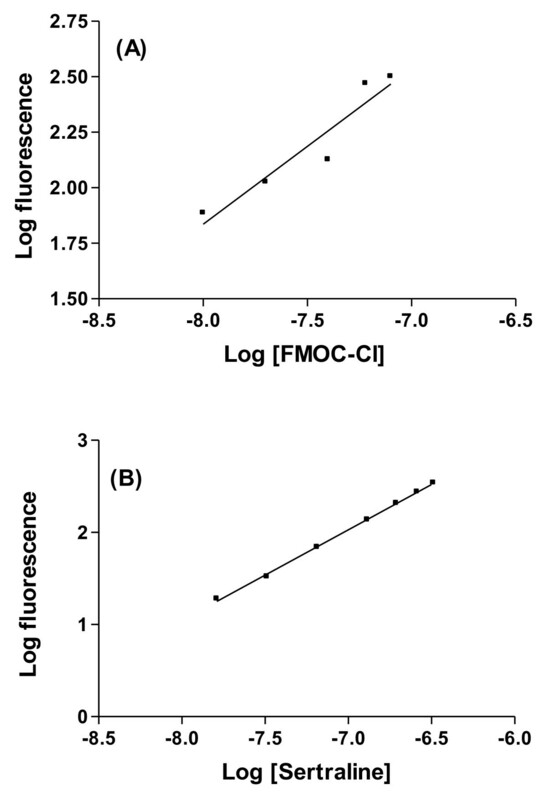 The fluorescence intensity of the reaction product was alternatively measured in the presence of excess of either FMOC-Cl or SER A plot of log fluorescence versus log [FMOC-Cl] and log [SER] gave two straight lines, the values of the slopes are 0.707 and 0.985 respectively(Figure 5). Hence, it is concluded that, the molar reactivity of the reaction is 0.985/0.707, i.e. the reaction proceeds in the ratio of 1: 1. Based on the observed molar reactivity of the reaction, and depending on the presence of secondary amino group and by analogy to similar reports (18, 20) dealing with the reaction of FMOC-Cl with compounds containing secondary amino group, the reaction pathway proposed in scheme 1 is presented. Limiting logarithmic plots for the molar ratio. (A) Log A vs. Log [FMOC-Cl] (B) Log A vs. log [Sertraline]. Proposed reaction pathway between FMOC-Cl and sertraline. NME designed the proposed method, analysed the data stastistically and wrote the manuscript and collect the literature review. FB proposed, planned and supervised the whole work. AA carried out the experimental work. All the authors read and approved the final manuscript.